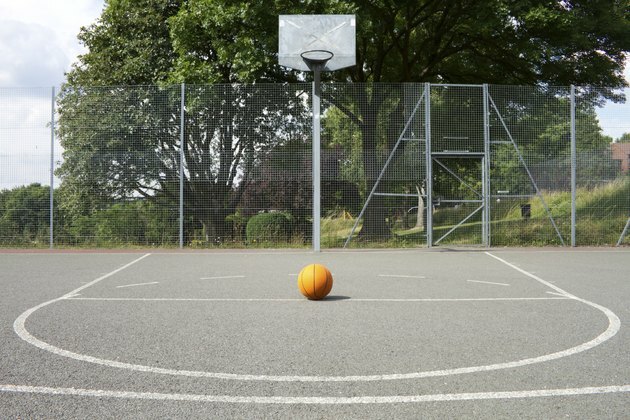 If you have some time on your hands, grab your basketball and head out to your driveway to practice some skills with individual games and drills. Don't use solitude as an excuse not to get out and play. You can compete against yourself and try to beat your own records with these one-person games. In this individual shooting game you compete against an imaginary professional player. Because errors hurt your score more than successful shots help it, you must minimize the number of shots you miss to win. Begin by shooting a free throw. You get one point if you make it; but if you miss it, the imaginary pro gets three points. Follow the free throw with jump shots from outside the free throw lane. Each jump shot you make earns you one point; but each one you miss earns two points for the pro. Keep track of your own score and the score of the imaginary pro. If you can reach 21 points before the pro, you win. The object of this game is to move as far away from the basket as possible. Begin 6 feet away from the basket. You must make five shots in a row before you can move one step further from the basket. Continue moving one step farther from the basket with each five shots made. This game takes its name from the Hall of Fame basketball player George Mikan. Set a timer to 30 seconds. Start the time and then begin shooting layups. Alternate between shooting left-handed layups from the left side of the basket and right-handed layups from the right side of the basket. Take your own rebounds and shoot the layups continuously. Count the number of layups you make before the timer goes off. See if you can beat this number on the second or third attempt. You can play this classic shooting game by yourself to practice shooting from difficult spots. Begin shooting from one side of the basket and then move to a new location with each successful shot. You can shoot from different locations in an arc shape around the key or mark different locations around the court through which to progress. If you miss a shot in the progression, you get one more chance to sink it or you must start the game over.